Trump Tower Moscow was an idea long-envisioned by President Donald Trump, as far back as when he first wrote about it in his book “The Art of the Deal” more than 30 years ago. However, Trump has denied that, while he was running for president, he had tried to get a Trump Tower in the Russian capital city developed. Others have underscored his attempts to do so, saying that they weren’t that serious and that any “plans” that were made were in the earliest of stages. Yet reporting from BuzzFeed News on Tuesday seems to indicate, not only was there efforts to get the tower built, but that detailed plans were made with Trump even signing his name onto a proposed idea for how the tower would look upon completion. Documents obtained by BuzzFeed News contradict that notion. There were architectural plans, emails, text messages, and other documents that suggested Trump was serious in trying to go through with a deal. Trump even signed a letter of intent on October 28, 2015, that included details for the proposed tower, including “approximately 250 first class, luxury residential condominiums,” 150 hotel rooms, a spa and fitness center, and office and retail spaces. That letter of intent was signed by Trump four months after he declared his candidacy for the presidency in June of 2015, according to CNN. BuzzFeed News’ reporting also indicated that Trump Tower Moscow would have been a 100-stories tall glass obelisk with a diamond-cut shape at its top. The Trump logo would adorn multiple sides of the tower as well. 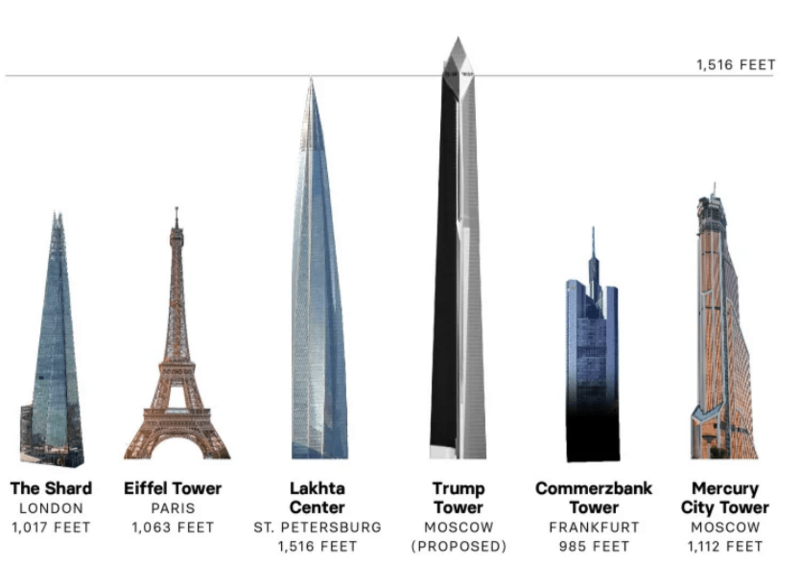 It would have been the tallest tower in Europe, according to the Russian real estate developer that Trump’s then-fixer lawyer Michael Cohen had been working with. At the top of the tower would have been a $50 million penthouse suite — which previous reporting from BuzzFeed News suggested would have been gifted to Russian President Vladimir Putin. The reporting from BuzzFeed News seems to indicate that plans were much more developed than members of Trump’s inner-circle had previously admitted.